"Want" doesn't quite capture the glory of the hottest thing to hit the publishing world this week: The Ryan Gosling coloring book, which yes, you need in your life. As do I. When it comes to the Baby Goose, you deserve to treat yo' self, girl. 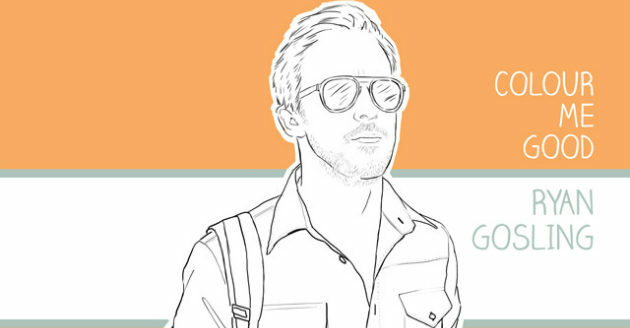 I LOVE MEL's Colour Me Good: Ryan Gosling coloring book offers 15 pages of Gosling sketches just begging to be lovingly filled in by the adoring Gosling fan. "Use your felt tips to colour in Ryan Gosling driving, eating, kissing, standing, walking, and all manner of handsome activities!" cries the back cover, adorned with a drawing of Gosling at the wheel a la Drive. At just £7.50/about $12 a pop you can't afford not to compulsively buy it now. How can you pass up the chance to draw yourself in as Lars's real girl? (Thanks to Lauren R. for sending this my way knowing I'd have my credit card out faster than you can say "Ryan Gosling shirtless.") More info at I LOVE MEL. I'm very disappointed in the lack of Breaker High Gosling.